This tenth volume of Prince Valiant is full of the usual adventures, fabulous artwork, humor, and variety we’ve come to expect from Hal Foster’s greatest comic strip. While I would not say it is one of the best or worst in the series to date, it has several notable moments and some awe-striking images. 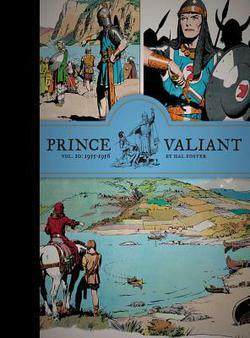 Prince Valiant, Vol 10 – witches and war just barely start to describe the adventures in this volume. The story begins with Prince Valiant, Aleta, and companions leaving the Misty Isles. Because they wish to return to Thule, they decide that rather than sail through the Mediterranean and then up through the English Channel to the Baltic, they will journey to Constantinople, through the Black Sea, up the Dnieper River, portage overland, and then sail into the Baltic Sea. It is a long journey full of danger, excitement, and dress buying—after all, Aleta insists they stop off in places like Constantinople and Kiev so she can buy new clothes and get a good bath. In the process, she often puts Valiant and his companions in some sticky situations, but her sense of humor and ability to flirt quickly get her out of them. At one point, she even finds herself married to the local khan, whom she then convinces to dance to his death for her, making her queen of the land—that is, until Valiant shows up to rescue her. No one seems to care that Aleta committed bigamy—after all, she was forced into it and played along with the monarch to buy time while never really stepping over her boundaries. If any woman in literature ever knew how to get herself out of a sticky situation with aplomb, it is Aleta. The portage scenes were truly striking. Not only is the image of a giant Viking ship being rolled over land and slid through mud beautifully drawn, but the thought of such an undertaking is completely mindboggling, yet I am sure Foster is not exaggerating in depicting such an event. Once the Valiant family is safely back in Thule, we get a good sense of how much Prince Arn has grown. Foster doesn’t give his age, but in the illustrations, he looks to be between about eight and twelve. And he is ready for his own adventures. Thule has issues with having enough food to feed all its people, but over its mountains lie pleasant valleys, perfect for farmland. Arn decides that finding a mountain pass to those valleys will be his first big adventure, and he wants to have it by himself, though eventually, he agrees to take Garm, a grown squire, with him. The two go into the mountains, but winter is coming on, so before they know it, they get trapped in a storm and have to build a shelter. They have quite the time trying to survive before they safely return home. These winter scenes in the mountains are some of Foster’s most dramatic in this volume, and they reflect his knowledge of winter climes, given his Canadian background. There is also one striking image of sailing into Thule, which Foster notes is based on drawings done during a visit to Norway in 1955. Foster truly did visit the places he drew—he cared that much about accuracy, and it is reflected throughout this volume. Of course, Valiant can’t sit around in Thule forever, so as spring approaches, he decides he’ll return to Camelot for the tournament at Pentecost. This adventure results in his discovering a new champion at Camelot whom he will aid in winning a fair maiden for a wife, and by a strange twist of events, he’ll also pick up a new squire, Alfred, whom I suspect will figure in future volumes. Volume 10 concludes with some additional advertisements and commentary on Foster’s work for the Northwest Paper Company and his drawings of Canadian Mounties that there wasn’t room to include in Volume 8. In addition, it is clear from these images that Foster was inspired by many of his winter scenes for this work in later depicting winter scenes in Prince Valiant, including in Volume 6 when Valiant is shown snowshoeing in North America. For me, seeing Prince Arn growing up is perhaps the most fascinating part of this volume. As the strip progresses, the characters do grow up and age, and while that aging is a bit delayed compared to real time, that’s all the better because then Prince Valiant and his companions stay young longer, and as a result, we have a strip now approaching its eightieth anniversary. Fantagraphics has already produced Volume 11 of the series with plans to release Volume 12 in December so stay tuned for more reviews. Tyler Tichelaar, Ph.D., is the author of The Children of Arthur series, which includes the novels Arthur’s Legacy and Melusine’s Gift, and he has written the nonfiction book King Arthur’s Children. You can learn more about him at www.ChildrenofArthur.com.